Size of Baby: According to Baby Center, the size of a rutabega (I don’t even know what that is…) – about 13 1/2 inches and about a pound and a half. Maternity Clothes: Pants are definitely required…I can wear pajama pants around the house still, but maternity pants only in public. 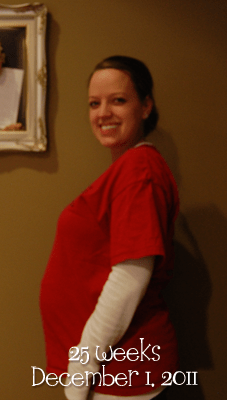 I might have a few shirts that I could still wear, but I’ve been wearing all maternity! Although I still do have a few pairs of pants that are too big. Belly Button In/Out: Still in, but not by much! It stretches out a little further every week. I’m going to be an “outie” if it stretches out much more! Stretch Marks: None, thank goodness! Those weird varicose vein looking things on my belly are more prominent this week though. Movement: She’s been moving a lot more during the day this week…pretty much non-stop over the past two or three days! Sleep: Really not bad, but I have been waking up super early again. What I miss: I normally take showers and baths like scalding hot, and I can’t do that right now. This week, I’d really like a hot shower as cold as it’s been! What I am looking forward to: Our 4D ultrasound is Tuesday! Symptoms: Some pain last night…to the point where I had to take a warm bath to try to calm it down. It scared me a little, but it’s gone this morning, so I think it was just stretching. I’ll occasionally have a contraction, but nothing consistent and painless. Best Moment This Week: Feeling her kick all day!